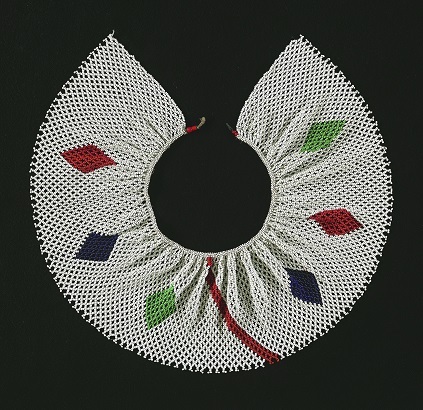 This exhibition celebrates the richness of Zulu culture represented by beadwork which has been collected by The Durban Art Gallery over a period of many years. This is the first time it is being shown to the public. The Director of The Durban Art Gallery, Dr M M Xakaza, in his foreword to the catalogue, writes: “Curators Anthea Martin and Hlengiwe Dube have crafted this exhibition to highlight the fact that traditional Zulu society has never been monolithic in terms of their usage of body adornment as a form of cultural expression. Over a hundred items were selected from the Durban Art Gallery collection for their quality and as examples of beads from many of the areas in KwaZulu-Natal. The exhibition is accompanied by a full colour catalogue which documents each item. This is an essential aid for the understanding of each artefact. The English and Zulu name is given, with explanations of place, age, function and materials. The exhibition will have an educational component with lectures, workshops and a website for access by students. The exhibition will close at the end of the day on April 29, 2018. The Durban Art Gallery is situated on the second floor of the Durban City Hall, entrance in Anton Lembede (formerly Smith) Street opposite the Playhouse. More information on 031 311 2262/6.